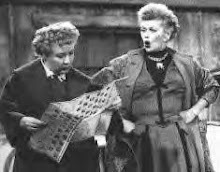 Lucy and Ethel have found that in our media center, opening up the shelves by rearranging books, constantly weeding, and even purchasing more shelving has increased our circulation of books, especially in the non-fiction section. We try to put as many books on display with fronts forward as we can. I, Lucy, am a weeding fanatic--I have no problems throwing away books that either haven't circulated in several decades, that are nasty looking, have ugly covers, etc. If you have trouble weeding, or need suggestions, check out Florida's amazing Sunlink site! They also have a new book out on weeding. If you have problems throwing away a book, get your teachers to do an altered book project with some of your undesirables! If you don't know what an altered book is, click here. I have purchased several books from Amazon on making altered books--my teachers beg me for my discards, we are keeping books out of landfills, etc. 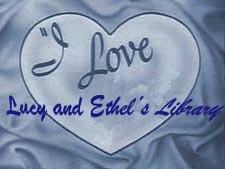 If you're like Ethel and me, you have at least one library pet peeve--one thing that just drives you nuts. Ours pet peeve is when some darling teen walks along our shelves, and slams all the books to the back of the shelves! (Isn't it amazing what can annoy a person?) If this is your pet peeve, try the solution that Ethel came up with. She has had our techs save every bit of the white Styrofoam packing material that comes with computers. She then placed it behind the short books on our shelves and now our books can't be pushed to the back, nor can a darling student throw books behind the others! It also keeps the stuff out of the landfill. Ethel is thinking of some way to make these more attractive--when she comes up with that idea, I'll post it!